It was directed by: Simon Barrett, Adam Wingard, Eduardo Sanchez, Gregg Hale, Timo Tjahjanto, Gareth Huw Evans, and Jason Eisener. 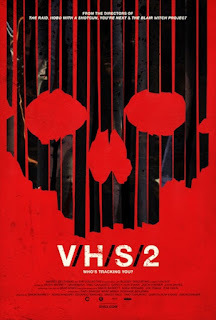 Please briefly summarize the plot: A sequel to the 2013 anthology horror film, V/H/S/2 tells an overarching story about two private investigators trying to track down a missing college student who stumble upon a bunch of VHS tapes at the student's residence. Each tape contains a dark story that shows the death of one or multiple people. There is a story about a man with a bionic eye who ca see the dead, a bicyclist who gets killed by zombies, a group of reporters investigating an Indonesian cult, and some kids who get abducted by aliens. How is this film culturally/ historically significant? V/H/S/2 gives some up and coming and newer horror directors a chance to show off their skills in a condensed manner. It also pays homage to the way that VHS tapes and home video were so instrumental in helping the popularity of the horror genre reach a new level of popularity in the 1980s and 1990s. How did this film make you feel: Despite so many of you complaining, found footage films really creep me out most of the time. V/H/S/2 didn't creep me out as much as the first film (which had four excellent segments, one that was OK, and a better framing device), three of the four installments in this one were pretty good. The bionic eye installment ("Phase 1 Clinical Trials") was fairly tame so far as V/H/S/ goes but "Safe Haven" (the Indonesian cult story) was pretty good and disturbing. "A Ride in the Park" was a decent zombie story, but it was honestly funnier rather than being scary. "Slumber Party Alien Abduction" was pretty dull and frankly hard to watch. It was the only one where I felt the "found footage" gimmick detracted from the film. What were the most impactful moments of the film? "Phase 1 Clinical Trials" does a nice job of building up suspense. It's fairly easy to determine what's going on but it does feel a bit oppressive and claustrophobic after the POV character first sees a ghost. "Safe Haven" shows a mass suicide at a cult compound (complete with poisoned beverages and close range gun shots) that is really disturbing. The zombie story has a few really funny parts, particularly when the zombies attack a kid's birthday party at a park. There's a part where a zombie gets thrown onto a grill that definitely...leaves a mark. Get it? Leaves a mark? With what other movies would you compare this film? V/H/S/2 obviously has roots in both the found footage genre and the anthology films genre. Movies like Creepshow, Tales from the Darkside the Movie, Trick 'r Treat, The ABCs of Death, and Black Sunday all share the anthology theme (with varying levels of connection) while the found footage aspect is drawn from movies like The Blair Witch Project, Paranormal Activity, and others. What stands out about this film? Once again, anthology movies get the chance to deliver multiple scary stories without all of the fat needed to pad the movie's running time. The gore effects in this movie are incredible. There are some very, violent images in the movie as the filmmakers really don't shy away from anything. It's nice to get a mixture of haunts (ghosts, maniacs, aliens, cultists, demons, and zombies) in one place, too. Also, "Slumber Party Alien Abduction" is perhaps a poster child for everything that people use to degrade the found footage sub-genre: It's loud, hard to follow, overly shaky, nonsensical, and features annoying characters with little characterization at all. What message do you believe the filmmaker was trying to convey?Always listen to women who follow you home from the doctor's office, don't break into people's houses and watch unmarked VHS tapes, don't get to close to a bleeding person, and don't hang around crazed cults.